In driving rain and sleet 22-year old Private Frank Lester (Lancashire Fusiliers) performs a deed for which he was awarded the Victoria Cross. During clearing operations in the village of Neuvilly with a party of about seven men under an officer, he is the first to enter a house from the back door. He shoots two Germans as they attempted to get out by the front door. A minute later a fall of masonry blocks the door by which the party has entered. The only exit into the street is under fire at point-blank range. The street is also swept by fire of machine guns at close range. Observing that an enemy sniper is causing heavy casualties to a party in a house across the street Lester exclaims, “I’ll settle him” and dashing out into the street, shoots the sniper at close quarters, falling mortally wounded at the same time. Major Ernest Frederick Powys Sketchley DSO (Royal Marines Light Infantry) is killed at age 35. He is the son of the Reverend Ernest Powys Sketchley. Second Lieutenant Robert Hugh Alban Cotton (Army Service Corps) dies in Italy at age 29. He is a Clerk in Holy Orders and Assistant Priest at Holy Innocents Church. His brother was killed in June 1916 and they are sons of the late Major General W H Cotton. Chaplain Archibald Owen Carwithen Longridge dies of wounds at age 38. His brother was killed in August 1916. Corporal John Henry Courtier (Machine Gun Corps) is killed at age 23. His brother was killed in September 1915. Corporal Thomas Black MM (Royal Engineers) dies as a prisoner of war at age 26. His brother died of wounds at home in 1916. 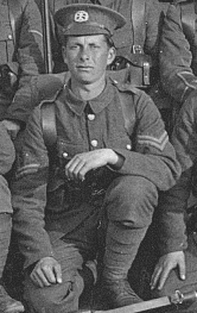 Private Thomas Maxwell Stevenson (British Columbia Regiment) died of wounds received on 20th September. His brother was killed in January of this year. He was drafted under the Military Act of 1917.